Nicknamed the Emerald City for a reason, Seattle is filled with green spaces and no shortage of ways to access them. 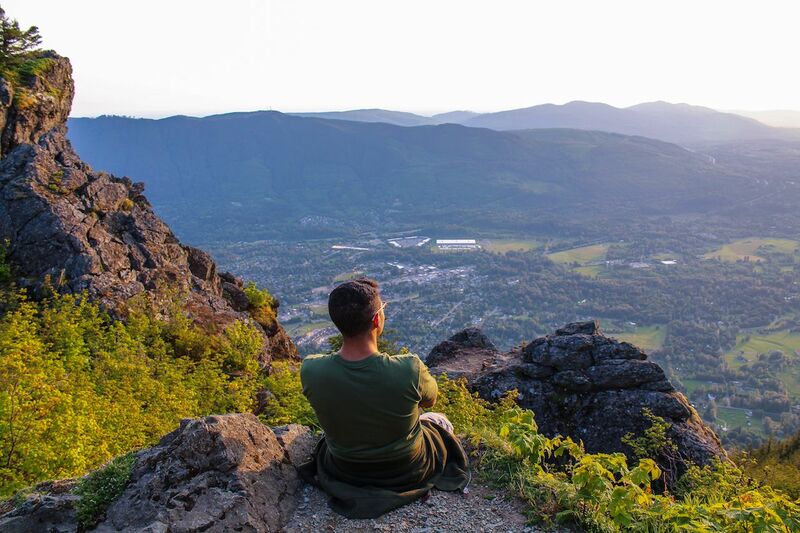 Whether you want a gentle walk within the city limits or a drive to the nearby Cascades to climb mountains, there is a hike here for every level of outdoors person — many less than an hour away. While most of these treks are relatively family-friendly, remember the forests here are immense. Wear sturdy boots, bring the hiking essentials described below, and let someone know where you’ll be hiking before you hit the trail. Mount Si is a great middle-ground hike. It’s straightforward enough that most people can hike to the peak but tough enough that even experienced hikers enjoy reaching the end. Similar to Mailbox Peak below, hikers use Mount Si as a training ground for climbing some of the higher mountains in the area. For this and many of the other hikes on this list, be sure to carry these essentials: water and extra food, compass, sun protection (sunglasses and sunscreen), extra layers, headlamp/flashlight; first-aid supplies, knife, firestarter, and matches. Starting low, the trail ascends for most of its length going through a variety of areas, ranging from easy to quite strenuous. Passing through a stand of old-growth forest with enormous trees, the climbing becomes increasingly aggressive until you reach the summit. Views of Rainier and the surrounding peaks dominate the skyline. From the top you can see the Haystack. This is Si’s real summit, but it can only be reached by a rough vertical scramble. Be very careful if you decide to climb this. Every year people are badly injured after falling from the Haystack. Although wildly popular, this hike is quite the workout. Used by mountaineers as a training ground for climbing nearby Mt. 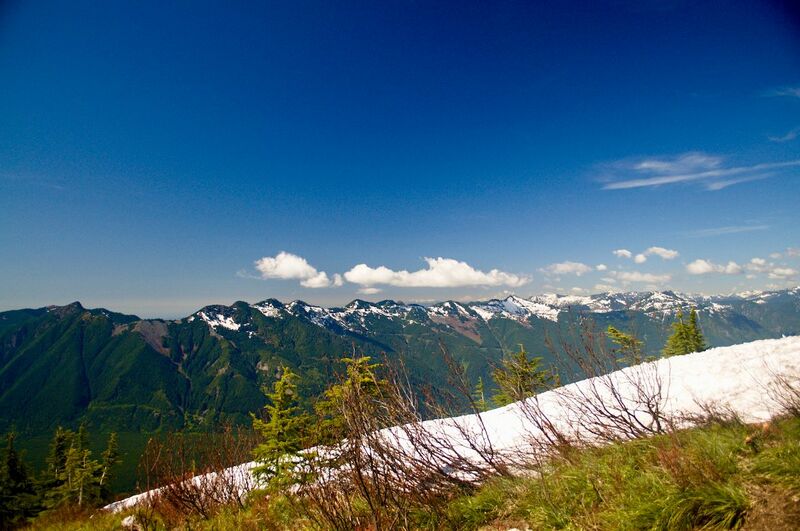 Rainier, this trail is guaranteed to get your thighs in shape for hiking season. After leaving the parking lot, you cross a handful of bridges and creeks before starting to climb in earnest. From here the trail does not let up as you gain switchback after switchback before reaching the mailbox at the top. There actually is a mailbox at the top of this peak, and hikers decorate it with a variety of stickers and trinkets. The views from the top make the climb worth it as you have a great vantage point of other peaks in the area, as well as Mt. Rainier rising up in front of you. This hike is the toughest on this list, so make sure to bring the 10 hiking essentials and come fully prepared for the task ahead. Not many cities can boast of a 534-acre natural park located within their boundaries, especially one with this much to offer. 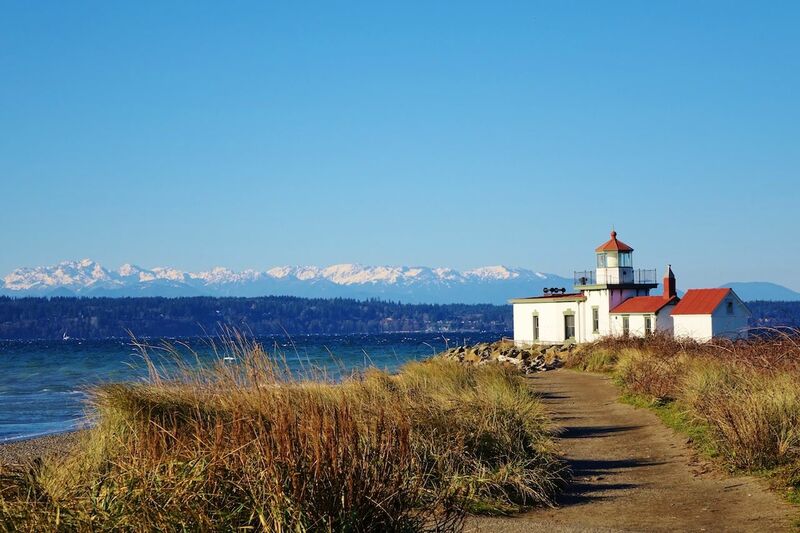 Discovery Park is perched on a bluff overlooking the Puget Sound, and on a clear day, you can view both the Cascade and Olympic mountain ranges. A variety of trails pass through the interior of the park, allowing guests to see an assortment of environments ranging from meadows to forests to sea cliffs. In this forested sanctuary within the city, visitors have the chance to spot dozens of bird species they might not normally see. To best experience this park, look at the maps at the park entrance and select a handful of loops to explore. None of the trails are long or strenuous, and all can be hiked relatively quickly. Drive time: Discovery Park is adjacent to Seattle’s Magnolia neighborhood, and 20 minutes from downtown. 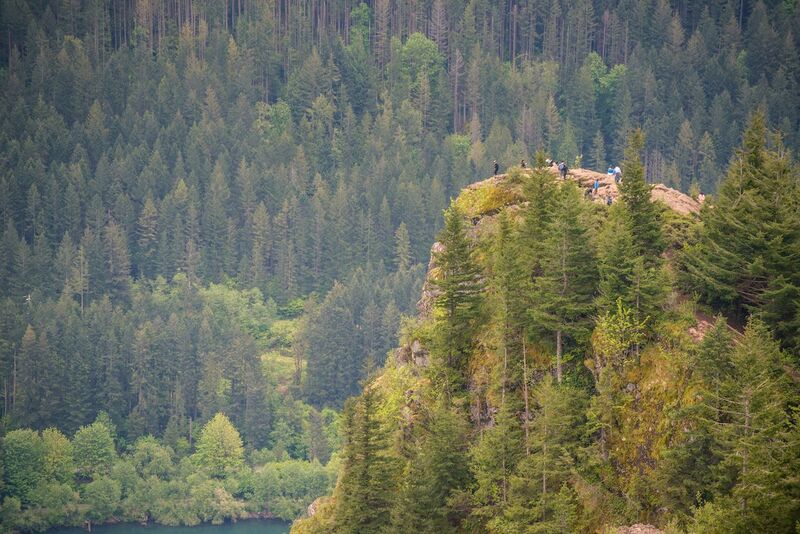 Rattlesnake Ridge — also called Rattlesnake Ledge — is a classic, though very busy, trail that ends with a beautiful view over Rattlesnake Lake and the Snoqualmie River valley. A straightforward hike, it starts from the parking lot and heads immediately uphill going through switchback after switchback for about two miles until you reach the ledge at the top. The view from the ledge and the cool breeze will make you forget the heart-pounding hike up. The ledge is extremely exposed, ending in a sheer cliff, so approach slowly and carefully. This hike is extremely popular and best done on a weekday or very early on a weekend if you want to avoid the crowds. 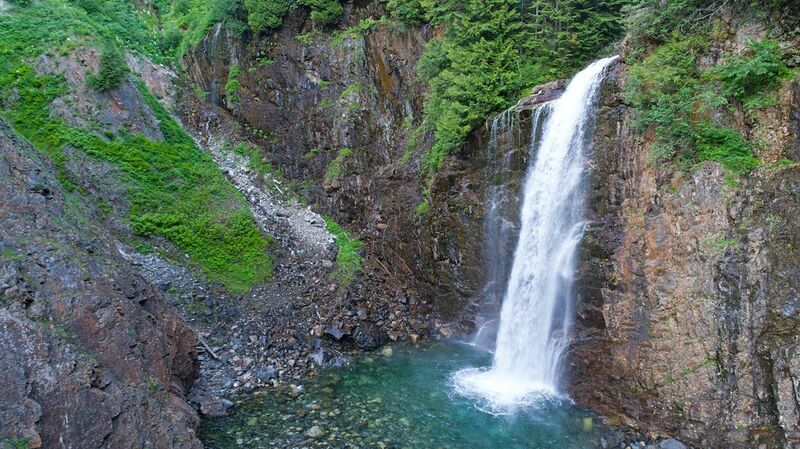 Of all the waterfalls included in this list, the three sections of Wallace Falls may be the most impressive. 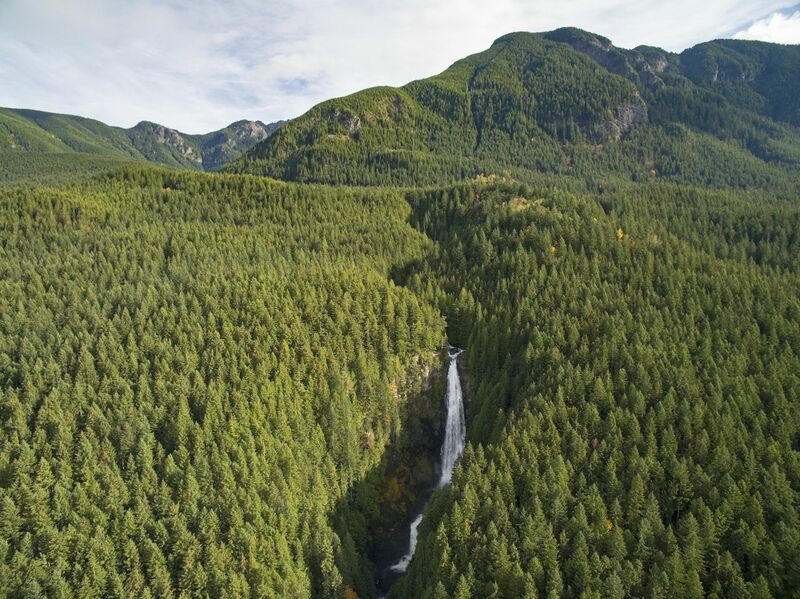 After parking at the Wallace Falls State Park, and starting from below the falls, you’ll walk upriver along a well-maintained trail that follows the Wallace River to the first set of falls — known as the Lower Falls. From here, continue up in elevation to the next (and arguably best) viewpoint for the Middle Falls. 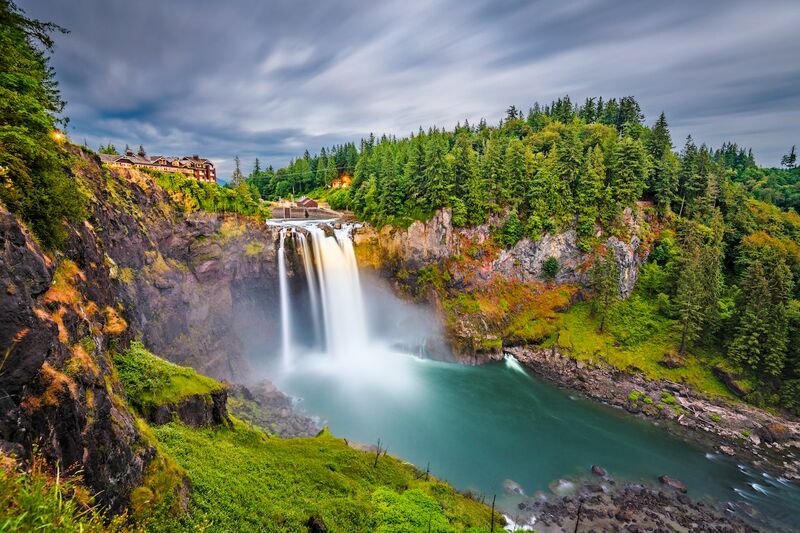 Enjoy a panoramic view of this enormous waterfall as it plunges 265 feet into a splash pool before continuing on through a series of smaller tiers. There is one more viewpoint further upriver after a thigh-burning half-mile of switchbacks that gives you a view of the top of the falls. 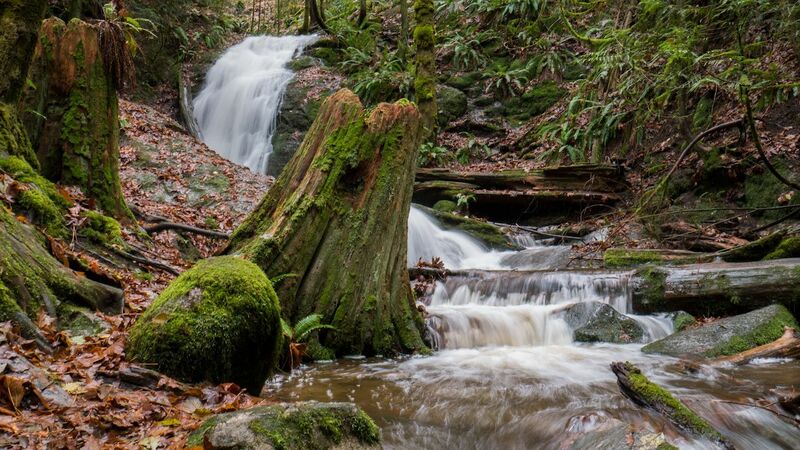 Located within Olallie State Park, the Twin Falls trail is a moderate out-and-back hike that leads to a set of waterfalls tucked into a small canyon. The trail starts by following along the river before heading into a swampy section of forest, where you can see skunk cabbage in the spring and wildflowers in the summer. Occasionally elk can be seen or heard nearby. After climbing a series of gentle switchbacks, hikers arrive at a bench that gives a view of the falls across the river valley. Continuing along the trail for another couple of minutes, you will reach a set of steep stairs that deliver you to the viewpoint of the lower falls. This is a veil-style cascade that gently flows down an enormous slab of rock. Walk back up the stairs and continue onto the bridge, which crosses the river above the lower falls. From here you can view the upper falls, which is a series of two “twin” falls. Franklin Falls is one of the best “bang for your buck” hikes in the area and a great place to bring new hikers or visiting family members who want to see some of the splendor of the Pacific Northwest. The hike is a gentle mile out along a well-marked and sturdy trail to an impressive 70-foot waterfall that crashes into a large splash pool below. When the falls are running at their peak, consider bringing a rain jacket to protect yourself from the spray given off. During winter months, this makes an excellent beginner snowshoe trek to see a frozen, icicle-covered waterfall. This is one of the most popular hikes in the area, so arrive early to get a parking spot. 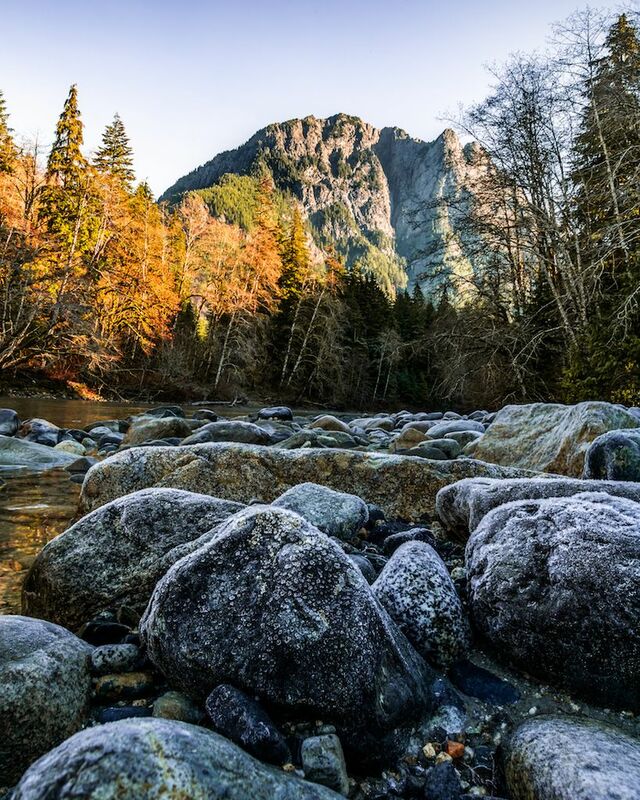 The Pratt River Trail is an excellent choice for hikers of all ages and abilities. Starting from the parking lot, you cross the middle fork of the Snoqualmie River on a rustic wood and metal bridge then continue downstream. During spring and summer, the trail plays host to a variety of blooming wildflowers, riverside fauna, and excellent birding opportunities. This makes a great winter hike because of its low elevation, which gives you a chance to get out when the high country is snowed in. The hike is an out and back, but by taking advantage of a variety of connecting trails, it can be extended nearly indefinitely. Nearby Coal Creek Falls is a perfect choice for a family-friendly hike that works in any weather conditions. A well-maintained trail leads through a thick forest filled with a variety of deciduous and evergreen trees, berry patches, and wildflowers. Coal Creek Falls sits within the Cougar Mountain Regional Wildlife Park, which was a coal mining site from 1863 until 1963. Alongside the trail are reminders of this past; visitors can see large holes that are evidence of old mine cave-ins. Stay on the trail and follow the park’s signage to avoid injury. After hiking roughly 1.25 miles, you’ll come across Coal Creek Falls. It’s a pretty — but small by Pacific Northwest standards — waterfall that can be easily viewed from a bridge running across the creek below the falls.